Let’s put aside the debate about antigenic proteins introduced by transgenes in GMO crops. Transgenes are genes from species that are not naturally present in crops of feed or food importance, e.g. spider genes, bacterial genes, viral genes, etc. These transgenes are capable of producing proteins in the plants that have never been in the human diet over the course of human evolution, stretching back thousands, even millions of years. GM proponents and regulators claim pseudo-scientifically that these novel new GM foods are ‘substantially equivalent‘ to conventional ones, despite a lack of human clinical toxicology studies to prove it; or, they claim that these proteins are inconsequential and do not represent a threat to human health, or the health of the biosphere as whole because they say so – a plea to their own self-appointed, baseless authority. This debate about whether or not GMO foods contain problematic proteins is meant to confuse and distract from the real issue that if you eat corn, soy, cottonseed or canola containing GMO products – and everyone does since nothing is truthfully labeled – you are ingesting glyphosate (aka Roundup) residues. How can I say that? Because these ungodly organisms have been designed to survive the equivalent of a chemical apocalypse. GM Monoculturing using glyphosate-resistant plants requires the widespread application of a systemic life-killing concoction of chemicals to the land – literally carpet bombed like Agent Orange herbicide in Vietnam — that kills every plant but the one designed to somehow resist dying after being sprayed. The result? 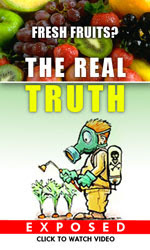 Massive chemical injury and contamination of the plants intended to be your food. I will say it again, you are insane if you believe that ingesting Roundup contaminated food is safe, especially if you let your children consume it. In a world where Department of Children and Families can threaten to take your children away if you don’t pump up to 80 vaccines into them as children, knowingly letting your child eat food poisoned with glyphosate formulations, which have been linked to over 40 diseases in the peer-reviewed biomedical literature – should be considered at least as an egregious offense. Please read “Extreme Toxicity of Roundup Destroys GM/Non-GM ‘Substantial Equivalence’ Argument,” if you think these statements are hyperbolic or intended to promulgate fear-mongering. Take away the voluminous industry-funded ‘research’ they paid for to market their product and cover up its harms, and through publication bias pushed into the popular consciousness as ‘evidence’ for why you should enjoy intentionally eat chemicals, and you are left with a truly dismal picture of what is really going on. Roundup is now found in our air, our water, our food, our rain, making avoidance nearly impossible. It is destroying the soil, including the still mostly unexplored biodiversity of the soil organisms found there, including strains of major food importance. It is found in breast milk, it is destroying the coral reefs, it exhibits carcinogenic, endocrine-disruptive properties in the parts-per-trillion range. And still, our government – specifically the EPA – thinks you can live with them increasing the ‘acceptable level of harm’ because it is bioaccumulating everywhere, and they don’t’ know what to do. Monsanto, of course, directs and in some way owns our government. Just look at who they have placed in positions of power if you need proof. This post is really not meant to speak to the choir. We have a million unique visitors a month, most of whom are already aware of what’s going on, and who want to change the trajectory in a way that does not lead to the collapse of the biosphere, and our support system with it. This post is meant to call out those who, quite frankly, are whoring themselves to the biotech and chemicals industries. Who write articles and blogs who claim those of us who do not wish to see our children die young of idiopathic diseases, leukemia, or suffer through accelerated neurodegeneration – think autism spectrum disorder – related to incessant chemical exposures, are ‘anti-science,’ ‘fear mongers,’ ‘irrational parents.’ They have blood on their hands. Despite our firm convictions, the evidence itself proves this. Yes, you are insane if you eat GMOs, or support the agenda. Ban Roundup and GMOs is the mantra I would love to see repeated, incessantly, into the future. Till it’s done. Then, perhaps, when the precautionary principle is implemented, we can begin to cultivate sanity again and reverse the process that is killing our planet. Be the first to comment on "Why You Are Insane If You Think GMOs Are Safe"